Coming July 1st, 2013 is the launch of the Summer Long Challenge with The Crochet Crowd. Though a lot of crocheters store their yarn and hooks over the summer, many crocheters hook all year long. I should know, I am one of them. Due to popular demand, Mikey & Cathy are doing a summer long crochet challenge. We are currently doing a Cathy’s Hook Club Challenge with the Amazing Shawl. It’s now my turn for Mikey’s Afghan Club Challenge. That means it’s an afghan challenge. Many people emailed and left comments asking for the next challenge. We are going to keep the momentum going. We want you to enjoy your summer and not feel under the clock with having an afghan done in merely 4 weeks. Summer is usually about spending time with family and friends. We know it gets hot and there will be days where it’s just too hot to crochet. Due to summer usually being relaxed and fun. We wanted to open up the challenge for you to have a choice on the size afghans you crochet. Though the pattern calls for a certain size, we are going to allow the afghans to be submitted from minimum Baby Size of 36″ x 36″ all the way to King Size. You can decide for yourself which size afghan you will want to make. I will figure out the math for you to know what your starting chains should be. Like always, I will do my very best to get you the information you need. We realize that there may be an unfair advantage of people who can finish several baby size versions for the random draw. To compensate for this, Red Heart agreed that we could do three draws at the end to award three people with the stuffed Red Heart Yarn Tote. Remember, the draw is random. So it’s anyone’s opportunity to win the gift bags. You may use ANY YARN you wish. Though Red Heart is sponsoring us for the giveaway, they realize you have yarn stash. Anyone on Planet Earth qualifies. Sorry we are not shipping to Mars or Jupiter at this time. Due to the length of this challenge, I will not be giving a 15 day advance warning on the pattern or materials needed. The challenge is already 9 weeks long. Remember, our challenges are about community spirit of sharing our creations, encouragement and celebration. For each person that finishes an afghan, you are already a winner in finishing a fabulous project. The giveaways at the end are RANDOM DRAWS. If you would like to feature your afghan on Facebook, it is up to you post it there. We do not upload any photos to Facebook. You may post your WIP (work in progress) photos and final projects. We love to see inspiration in the making. When submitting your afghan via email to us at Challenge@TheCrochetCrowd.com be sure to tell us your name and address. We need this to identify your afghan at the end. We will then take your afghan photo and upload to our Flickr Page for everyone to see. It is your responsibility to ensure your afghan is in our gallery before the deadline of 11:59 pm on Labour Day, September 2nd, 2013. 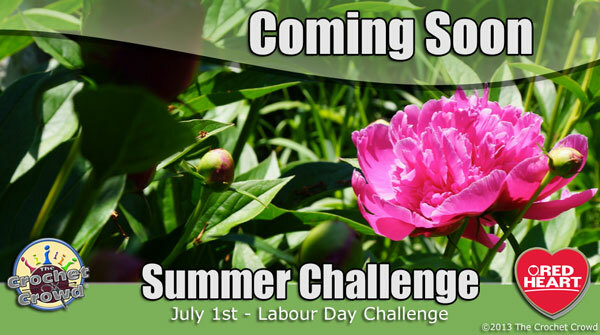 All challenge details will be released on July 1st, 2013 on our Crochet Challenges Page on my Website. Stay tuned for further details. This entry was posted in Crochet Challenges and tagged Afghan, Afghans, Cathy, Challenge, Craft, Crochet, Facebook, Knitting and Crochet, Mikey, Pattern, Planet Earth, Red Heart, Summer, Summer Crochet Challenge, The Crochet Crowd, Yarn. Bookmark the permalink. I would love to try this but in a baby size, please. Do you have a pattern for a Spiderman blanket to crochet? So excited about the extra time AND the extra drawings. I already gifted away the Ocean Waves so I am ready to begin anew! The Ocean Waves was my first. I just love seeing all the creative choices of color when the photos start coming in. Bring it on! Hmmmm looking forward to this ….never done a crochet challenge before! Can’t wait to see what this afghan crochet challenge will be. I really enjoyed to Ocean Waves Challenge even though I missed the deadline. I will be away from June 28 to July 7, so I will have some catching up to do. I am sure this will be a good one. Thanks Mikey for making it an all summer long one. Will give me lots of time to finish it. Awesome! I am still working on your last afghan challenge (being a teaching is too exhausting so my creative outlets sometimes have to be put on hold). Now I can share that project for this challenge…thanks bunches. I enjoy seeing everyone’s work and projects. My mom taught me how to crochet and this has been something only her and I share – which makes it special. She’s so proud of the things I’ve done on my own. I’m running out of room for afghans I make, and for some reason I feel slightly embarrassed to just give them away. What if they don’t like crocheted items? or what if that person doesn’t really like it, etc….the list can go on. Does anyone have ideas of what I can do with so many blankets? Hi Martha, WhileI don’t know where you live, there are possibly agencies in your area that would accept them. You could find a homeless shelter in your area. Or home for young girls who are pregnant and for whever reason have no place to live but there. Or a womens shelter (where women sometimes go to get away from abusive situations). I am waiting “not very” patiently for the challenge pattern to be posted. This will be my first challenge and I am looking forward to it. It is time to use up some of the mountain of stash that I have!! Love your site!!! I have learned so much from you. Thanks, Mikey! Oh this sounds like fun and as I crochet slowly I think I can do this challenge. hope to try and finish this challenge…can’t wait to see what the pattern is going to be. This will be my first challenge. Hopefully I will be able to finish it on time. Can’t wait to start. I think this is a great challenge as I need to crochet a blanket with a name in it for a friends daughter who is pregnant and due in October. My first challenge (well….by The Crochet Crowd anyways)….I can hardly wait. This will be my first challenge as well. Can you have more than one entry per household? My husband crochets as well and he may want to get in on the too. I am really excited! I never put my crochet away for the summer, that is what the air conditioner is for…lol. Looking forward to see what the pattern will be…. ( it feels like Christmas )…..too excited? So excited! I’ve not looked into the challenges before assuming they’ve been for North American residents only. I hope I’m lucky enough to win as we don’t have Red Heart here in Australia so I usually need to buy bulk lots of yarn to justify the shipping. Maybe I Just might get this challenge done in time. Can’t wait to find out what the challenge is gonna be. Will be in on this one. I came onto crochet crowd two weeks into it. Well , i pulled together color ideas from my yarn stash. Got it done two days late but had fun anyway. Learn a new stitch “the frog”, got to be an expert at it. —– Have had the afghan in my hall closet waiting to be given away, just like making thing then store them to be give away. so i also have gift stash along with a yarn stash. —- Today in church, notice a young couple who has been going thru some pretty rough times latest. I am now packing it up to give to them along with some other stuff. We thought about it but we decided not do that as we have to separate all the photos by size, different galleries and ensure that the sizes people are telling us are accurate. We want to be transparent and tell people that we are doing three draws, they are random, so it’s anyone’s opportunity to win. It might be fun to have a crochet challenge with doilies or flowers instead of afghans since they are smaller and you dont need as much time, so you can enjoy summer more. Great idea doing it over the whole summer and I have a nephew due to be born in October so working on a baby afghan is exactly what I need to do.. I finished one for him already but you never have enough crocheted baby afghans! Thanks Mikey! Well Mikey you deserve an A+! You answered all my questions in one place. Thank for giving us something to look forward to. Take Care and have a great summer! I am new to the Crochet Crowd and the challenges and looking so forward to hearing more on July 1st. Sounds like so much fun!! I can’t wait to do this challenge! It will be my first contest/challenge ever …! Thank You ” Crochet Crowd ” for this opportunity . I can hardly wait!! I love to crochet!! YAY!! I can’t wait to see what the pattern is going to be! Yeah I have to update that… got caught with my pants down on that one. Labor Day is Sept 2nd this year. I would like to try this challenge. I’ve done one before and it sounds exciting. Anxious for it to start. Oh this looks like fun and I do need to make both boys a new spiderman inspired Blanket!! Do you have a Spiderman pattern? My 21 year old granddaughter loves Spiderman. I would love to crochet a Spiderman blanket for her son. http://thecrochetcrowd.com/patterns-recommendations/955-superhero-dream-catcher-afghan.html Here’s a Spiderman Afghan Design.